The guys had excellent paths and contacts from Crosshill Ontario (EN94PM) during the September 20-21, 1997 contest. Crosshill is one of the highest spots in Southern Ontario at 1515 feet ASL and provides an excellent line of sight shot at other 10 GHz hangouts such as Bower Hill just outside of Woodstock. Graham VE3FHM and Steve VE3SMA used their dish and horn arrays pointed towards the Woodstock Bower Hill site where John VE3EZP was set up providing 10 GHz contacts. 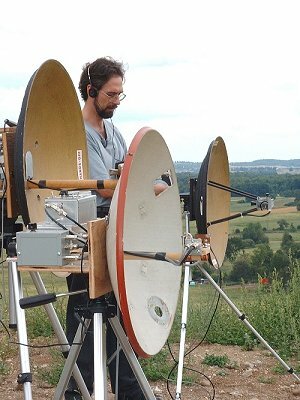 One of the more avid and active 10GHz and above operators is Steve VE3SMA. Steve is one of 2 or 3 Canadian hams known to be active on 24 GHz. Steve is shown here holding his home brew 24 GHz rig which can provide great multipliers for contests. The catch is finding another Canadian who also has 24 GHz equipment. The good news was that Bob, VE3OIK was able to provide Steve a 10 Km contact on 24 GHz. Bob VE3OIK was also able to add to his multiplier by working W2DRZ in Jamestown New York some 200 Km away using his homebrew Narrow- band SSB 10 GHz rig. John VE3EZP from London indicated that he has his 24 GHz home brew rig about ready for trials within the next few weeks. Just about anything imaginable from the junk box can be used in the fabrication of feedhorn supports. Anyone who was ever a mechanically minded kid will surely recognize the tripod supports for the 10GHz feedhorn. A source for sporadic Microwave stuff is Cohen and Cohen located on Merivale Road (near Slack Road) in Ottawa. (tnx to Janusz, VE3ABX) . Here are some known links to other 10 GHz and up sites.